Get your feet on the ground and your hands dirty for the sake of our planet! 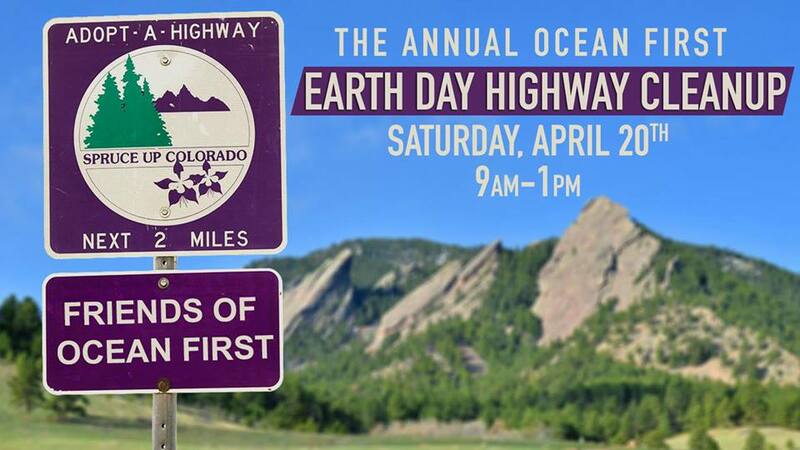 Ocean First has sponsored a section of the diagonal highway for almost a decade, and in honor of Earth Day, it's time for our annual clean-up. On Saturday, April 20th at 9:00am, we are meeting at Ocean First with our work boots, gloves, and oh-so-chic orange safety vests. After a short safety briefing, we will grab our trash bags and carpool to our sponsored section of the diagonal highway near Niwot, where the trash awaits our enthusiastic cleaning crew. Option to meet us at the Niwot Park & Ride at 9:30am, just let us know you'll be joining in Niwot by emailing us at lauren(at)oceanfirstinstitute.org. In the afternoon, we will return to Ocean First for lunch, prizes, and congratulatory pats on the back. To RSVP or learn more about the cleanup click here.